We had a great week. We tried to be very relaxed and spend a lot of time outdoors. Saturday and Sunday we just enjoyed time at home. The kids have started to occupy themselves, which makes me one happy momma. Monday we didn't do anything too exciting for Labor Day. We were supposed to go to the pool with friends but it was a very dreary day so the kids just played with their friends while the mommas chatted. Ben had to work (but he got time and a half and an extra PTO). Tuesday we started our Bird Unit Study. Per the kids request we began by learning about Waterfowl. I wrote a post all about our day which you can read here. Wednesday we made worked on our Waterfowl lapbook, read lots of books, made a Swan craft and had fun doing Eggsperiments. I have a post about all 4 Eggstraordinary Science Eggsperiments which you can read here. Thursday we took it easy. The kids had fun playing with trash and Rowyn had his follow up at the Surgeon. He is very happy to no longer be wearing a splint. Friday after driving Ben to work we went to our favorite Library Book Sale in Pickens, GA. Unfortunately because we got there around around 1pm the kids books were pretty picked over but we did still manage to get a few good ones. Afterwards the kids wanted to go to the park near our old home which has a pond. We had hoped to feed the ducks and geese and get in a nature study. But when we arrived we found that it was closed for renovations. So we went to another park where the kids played on the playground. Then we decided to take a little hike (in flip flops = not a good idea) to find a geocache. We had a great time and have logged our 20th find! After our hike I got a much needed haircut!!! Saturday the kids went to their Grandparents for a few hours so Ben and I could have a much needed date. We had lunch at a Mexican restaurant and then went walking around the mall. Try geocaching with your family. Its a great way to get the family outdoors for some fun and education. If you want to learn more about geocaching read my post over at Expedition Mom. If you want to add us as a friend on Geocaching.com we are balman4! This week we Explored Anseriformes and Found a Lost Paradise. And we scored 24 books for $7.50 at a library book sale. After the book sale we went to the playground and then decided to take a hike to find a geocache. The cache was not too hard to find but umm...getting back to the car was. Note to self: make sure your phone is charged so you can use the GPS to find your way back through the woods to the parking log. Doing lots of Eggstraordinary Science Eggsperiments with the kids. The relaxed approach to homeschooling is working great for us. What is not working is only having one car. Getting Unit Studies planned for the next few months. Lots of Bird books to the kids. We also started the Magic Treehouse series. Which the kids both love. Lunch dates with my husband. Saturday my mom watched the kids while Ben and I went to lunch and then window shopped at the mall (we were supposed to go hiking but it rained). Walking through the mall made me feel very old (so out of touch with fashion, etc). Ben and I also agreed that we are VERY happy to NOT be working in the retail industry anymore. My favorite resource this week has been our Apologia Flying Creatures of the 5th Day book. And also Homeschool Share which has great FREE lapbooks. I'm off to check out your geocaching post -- thanks, Kathy! 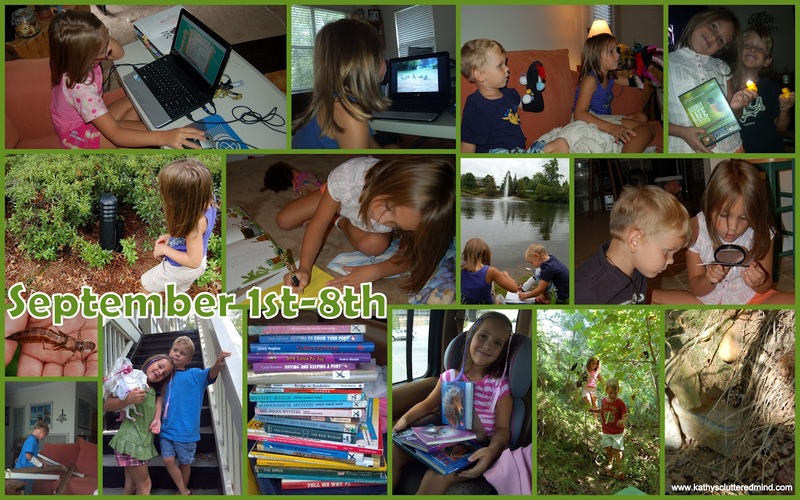 Lots of fun and learning in your week :) Thanks for linking up at Favorite Resources! Loved your post! My kids are such big magic tree house fans right now that I'm planning our unit studies to go along with the magic tree house books. Awesome we are doing Birds of Prey this week!